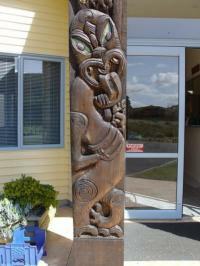 Two tupuna are depicted on the poupou. 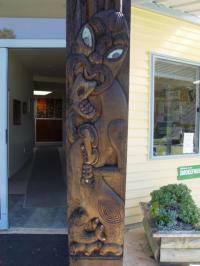 Tuwhakatera was a chief of the local iwi, Ngai Takato. Tuwhakatera had a son, Hoka, who longed to fight battles but his father would not let him because he was club footed and was afraid for him. When the warriors from the tribe went off to war, Hoka ran away with them. While away he was killed in battle. This upset Tuwhatere immensely. On our pou, Tuwhakatera’s club (mere) is a symbol resembling Tuwhakatera’s son. Tohe was a well-known chief that travelled along Ninety Mile Beach with his slave, Ariki. Tohe and Ariki travelled along Ninety Mile Beach naming a lot of the local places along the beach. Maori know the beach as 'Te Oneroa A Tohe.' On our pou, Ariki is resembled on Tohe's patu. There is also a pattern on Tohe's shoulder that represents Pukeko footprints. Pukeko regularly graze around our school.